"One opinion in the scientific community has been, 'If the ice shell is thick, that's bad for biology  that it might mean the surface isn't communicating with the underlying ocean,' " said Schmidt. "Now we see evidence that even though the ice shell is thick, it can mix vigorously. That could make Europa and its ocean more habitable." 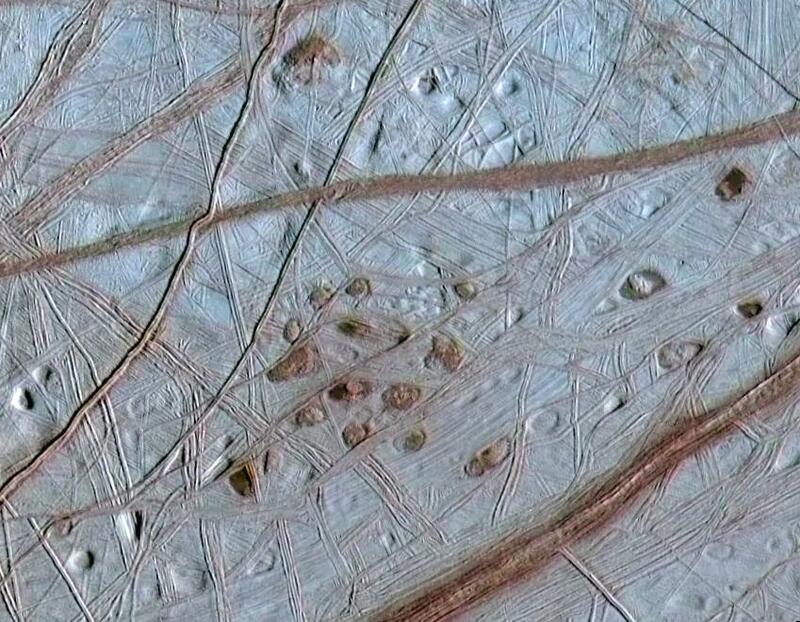 The scientists focused on Galileo spacecraft images of two roughly circular, bumpy features on Europa's surface called chaos terrains. 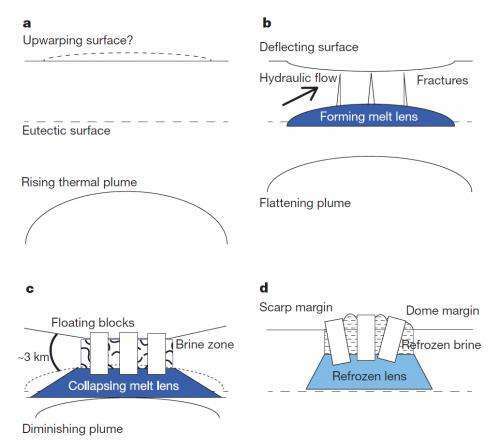 Based on similar processes seen here on Earth  on ice shelves and under glaciers overlaying volcanoes  the researchers developed a four-step model to explain how the features form on Europa. It resolves several conflicting observations, some of which seemed to suggest that the ice shell is thick and others that it is thin. "I read the paper and immediately thought, yes, that's it, that makes sense," said Robert Pappalardo, senior research scientist at NASA's Planetary Science Section who did not participate in the study. "It's the only convincing model that fits the full range of observations. To me, that says yes, that's the right answer." The scientists have good reason to believe their model is correct, based on observations of Europa from the Galileo spacecraft and of Earth. Still, because the inferred lakes are several kilometers below the surface, the only true confirmation of their presence would come from a future spacecraft mission designed to probe the ice shell. Such a mission was rated as the second-highest priority flagship mission by the National Research Council's recent Planetary Science Decadal Survey and is currently being studied by NASA. 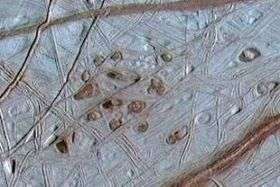 On Earth, radar instruments are used to image similar features within the ice, and are among the instruments being considered for a future Europa mission. "This new understanding of processes on Europa would not have been possible without the foundation of the last 20 years of observations over Earth's ice sheets and floating ice shelves," said Don Blankenship, a co-author and senior research scientist at the Institute for Geophysics, where he leads airborne radar studies of Earth's ice sheets. Schmidt and Blankenship's co-authors are Wes Patterson, planetary scientist at the Johns Hopkins University Applied Physics Laboratory, and Paul Schenk, planetary scientist at the Lunar and Planetary Institute in Houston. The research was funded by the Institute for Geophysics at The University of Texas at Austin's Jackson School of Geosciences, the Vetlesen Foundation and NASA. Watch them land something on there and realize that the reddish material is actually some type of 'extremophile' or the remains of microorganisms brought up to the surface by these same processes. "Hey, look! We didn't even have to dig." Not saying that it is biotic in nature, but it does kind of look analagous to how life looks in salt flats and glaciers and such. Europa is really far away. If a fracture communicates the surface and the lake, which means a extreme pressure difference with the exterior void (at least for a brief period), why don't we see geysers as we see in Enceladus? Maybe they occur from time to time, but we are simply not looking there when it happens. I wonder if it possible to send "Curiosity" type rovers to these moons of Jupiter and Saturn? Are there any plans in the making for landing anything on these moons? I'm not the final authority, but I believe that the distance between the liquid reservior and the surface is so distant thtat there is no direct conduit directly from the lake to the surface. So instead of a long crack and high pressure geysers coming out, you have lower pressure zones with slushy brine, and closer to the surface it is able to solidify under lower pressure, negating the causes of cryovolcanism. That said, I'm just making a guess. However, there are no approved lander missions, nor do any ideas have funding past the idea stage. Those "Europeans" must travel a lot in big vehicles - look at the tracks around the lakes! Seems odd how neatly the "domes" are contained by the "tracks". Was taking a look at the pic, and the bigger pic provided by Nerdyguy. Cant help but wonder what scores the marks on the surface? In the bigger pic if you look at the bottom left you will note another mound that seems to have track marks on it. Well, if there's life under the frozen lakes of Antarctica, then I can't see why life wouldn't be able to survive Europa. It should be interesting to see what they find there. I thought global warming happened in unison with solar system warming. Isn't there evidence some planets are warming as well? Can someone explain why the underlying ocean communicating with the surface would increase the chance of biological life as opposed to just a subsurface ocean? Europa is so far away from the sun that there's hardly any energy to be gotten that way. On the contrary: an insulated ocean could maintain higher temperatures (driven by a molten core, radioisotopes or simply tidal action from Jupiter) than one that is occasionally opened up to freezing surface temperatures. Great photo, I wonder if they are more of them, a series maybe ? It would be interesting to compare pics from different times to see if there's any type of pattern with the " blisters " popping. They really do remind me of rust blisters. - It provides a mechanism to transport more substances that are required for life. Some substances could come from meteorites, and others could be formed by ultraviolet rays and low pressures not available in the ocean, and then be transported to the subsurface oceans trough this process. Actually there is a probe design which could do it. The probe would be heated and slowly melt its way through the ice. The drawback is that we would probably use radioisotopes for heating/power and contaminate a potentially life-bearing environment with plutonium once the probe corrodes. Also we'd need to figure out how to put down a 7km long cable for data transmission without it breaking. I think the most interesting thing here is that there seems to be an energy source below the ice. Where there is energy and liquid we already have most of the prerequisites for life. I got that from the jpl/nasa photojournal site (below). Nice site, lots and lots of photos. But, I only saw the one on this subject. Maybe more on there, but it's not the best organization system. Sigh. Good to know that the above was the reason I returned to this thread. - It provides a mechanism to transport more substances that are required for life. Why should these substances be on the surface rather than further down? Meteorites form from the same stuff planets and moons formed from. Unless we are talking panspermia I see no real advantage. Honestly, I believe the conjecture that life would need nutrients from the surface is probably little more supported than most of the commentary that we provide. Albeit, it is from people who are more educated on the matter. I would guess that the idea is that if you have an environment that is 'cut off' from the outside - which was thought in this case - and the belief that europa has a 'frozen' core - That you need some mechanism that allows chemical, heat, or electromagnetic energy into the system for life to survive. If you need compound A, which turns into compound B. You'll need more A to continue, or energy to revert B back to A. We know comets contain amino acids amongst many other life chemicals. Therefore collisions deposit said chemicals on the surface, and upwelling provides a transport mechanism to move them to the interior. Now this will have been happening over eons, therefore vast quantities of "lifes" chemicals should me mixed with the liquid water in the interior. Since the moon has several kilometres of ice as a crusty shell, the interior is mostly protected from the harch radiation of space and jupiter. Any kind of thermal source heating the internal oceans, mixed with chemicals for life, and protection from radiation = LIFE in my opinion!!! Amino acid deposits on the surface, may also be catalysed into more complex assemblies via radiation. I suspect the internal chemistry of Europa will be spectacular. As others pointed out, WHAT IS THE BROWN STUFF??? Perhaps radiated/frozen (dead) algae/bacteria type lifeform?? Any kind of thermal source heating the internal oceans, mixed with chemicals for life, and protection from radiation = LIFE in my opinion! 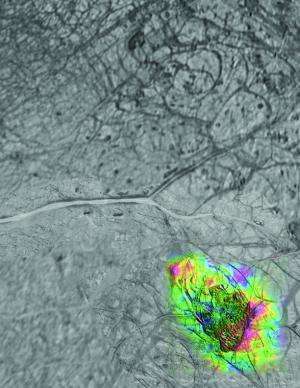 Europa's lakes could be full of acids from undersea volcanoes, unsuitable for life. In addition, they could lack the chemical energy source anyway, because of lack of working redox system. this is so exciting! why aren't the space agencies of earth cooperating on sending a probe to europa? The drawback is that we would probably use radioisotopes for heating/power and contaminate a potentially life-bearing environment with plutonium once the probe corrodes. Could we use an isotope with a shorter half life, like 210Po? It should be inert by the time the probe corrodes, it puts out more power/weight too. Also we'd need to figure out how to put down a 7km long cable for data transmission without it breaking. Through 7km of ice? I don't think so. Remember that the channel will quickly refreeze after the probe has passed it. We would need to have the 7km of cable aboard the probe (or more if we wish to have some mobilty for scouting after entering the subsurface ocean). Dragging it down from a spool on the surface is not an option. But since we can do radar imaging of subarctic mountains there might be some way? Could we use an isotope with a shorter half life, like 210Po? That's a bit tricky, since we need to get there first (flight time would currently be on the order of slightly more than a year using state-of-the-art ion drives). Which would mean a lot of decay has already happened and not much polonium would be left. If we use something like plutonium the radiation is actually the lesser problem. Plutonium has a high toxicity (LD50 is 0.32mg/kg body weight). Plutonium kills you a lot faster chemically than through its radiation effects. An acoustic modem would be a wireless solution, They are used in under ice applications currently on earth, its range would be limited by the density of the ice. Redundant methods of communication would probably be desirable though. I know inductive modems have also been used in sub-glacial communications, the range is limited but a number could be used in relay, maybe a series of sub-ice "buoys" connected by fiber, ULF inductance and/or acoustic. There's no easy answer the the isotope toxicity problem though. You could the RTG on the surface to power the probe via cables, but that brings back the cabling problem, and the ice cycling could lead to contamination anyway. Definitely an interesting one! I like the relay idea. Needs a different powersource, though, since an isotope/thermocouple reactor produces a lot of heat. I.e. your relay module would start melting its own way downwards. Such a relay/booster system would also be much less prone to damage if the ice shelf moves (i.e. if one of these bubbles/melt lenses occurs). A ripped wire would ruin the mission. And I don't think we would (could) spare the weight for redundant communications systems.